We made an emergency trip to the cabin today. Racing both time and temperature, my husband and I climbed into our snowpants, our sorrels and our hats and gloves so we could save our outdoor rink. It is only the end of January here in Minnesota, and there is entirely too much winter left to give up on skating at the cabin. So we sent the big kids off to school, loaded up our littlest, and drove the hour to the cabin for our workout. While we strained under the slushy, wet snow,the kind that would turn into rockhard chunks of immovable ice if left unattended, I started thinking (because that was easier than singing through heavy breathing). Anyway, I thought about how outdoor ice maintenance was a good metaphor for life. There are some parts of maintaining outdoor ice that is in our control, but for ninety percent of ice creation, we are at the mercy of forces much larger than we are. Ice happens at 32 degrees fahrenheit, and there needs to be a stretch of weather cold enough to make the freezing happen. If it gets too cold, the ice will break off in brittle pieces. In order to smooth it out again, you’ll need to flood it with a fresh layer of water. If there are drastic changes in air temperature, and the ice you are trying to maintain is on a body of water, you will absolutely end up with a crack or two. If there is a snow storm, you need to shovel and if there is a wet rainy, sleet storm, like what we had all weekend, you may have to make an emergency rescue. And, eventually the sun will warm and the ice will melt…ending the winter fun. Waiting for freezing temperatures….live with patience, if it is worth it, it is worth waiting for. Brittle ice that is too cold breaks….some things that you work for may not go the way you want, but buck up and do what you need to do to fix it. Flooding with water to smooth it out…sometimes you just need to get a fresh start, so don’t be afraid to start over. Cracks happen…expect that life will throw you jagged curves and while you are skating, just know that is where you need to jump. Keep the shovel handy…when you get dumped on, don’t spend a whole lot of time looking at it, just move it out of your way, so you can get back to doing what you want to do. Emergency rescue…sometimes you need to drop everything in the name of something you love. Ice does melt… so make the most of every day you are given. I don’t ice skate, but everyone else in my family does, and my kids equate winter at the cabin with skating and boot hockey. The outdoor rink that we maintain there is a huge part of our recreational time together, and it is something that keeps them moving and makes them smile. 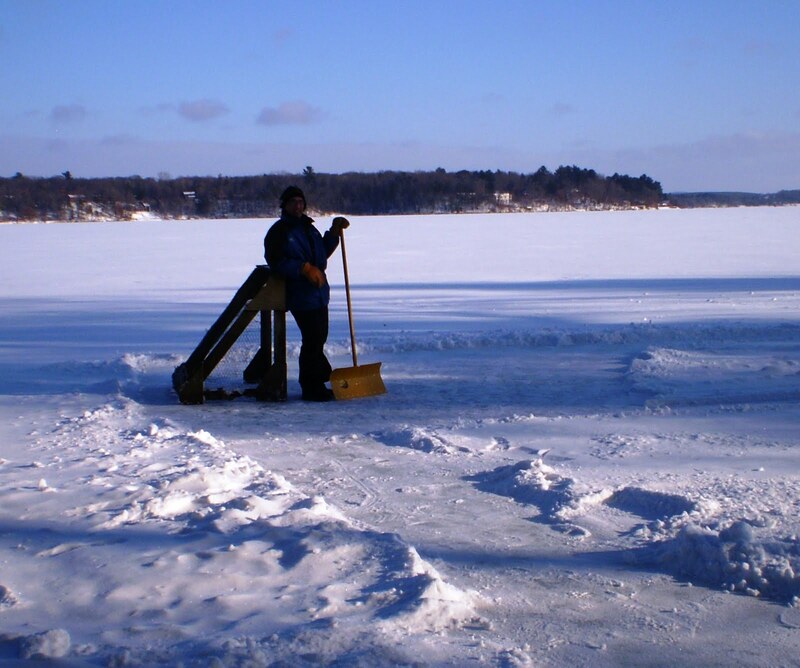 Stealing from the recently released movie Tooth Fairy “If you love something enough, it is never a waste of time.” I don’t love outdoor ice, but I do love what it does for our family, so I will never consider my time shoveling and scraping as a waste of time. You really did make great use of your "shoveling slushy wet snow" time. Great metaphor! I really need to work on jumping over the cracks.